Health Literacy is defined as the “degree to which individuals have the capacity to obtain, process, and understand basic health information and services needed to make appropriate health decisions.” (IOM). In other words, Health Literacy comprises the skills and knowledge one’s doctor, government, and insurance company expect a person to have in order to make good health choices. These can include finding providers, using preventative services, researching health concerns, and applying health information to your lifestyle. 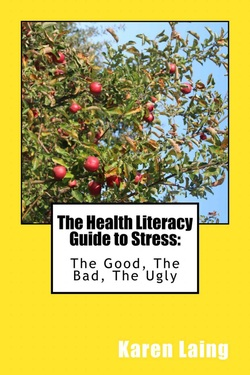 The Center for Disease Control estimates that 88% of Americans struggle with some health literacy skills. Healthy People 2020 has a goal of increasing health literacy through the creation of easier to read websites. Karen Laing is a published author! We all think that stress is “bad” for our health. But did you know that you couldn’t survive without some stress in your life. Your body thrives on it! On the other hand, chronic stress can have long term health complications and can make many diseases impossible to successfully treat. Come learn more about how stress impacts health and how to lessen the bad kinds of stress in your life. Click on the buttons below the book’s picture to order this book. Or Click on the button directly below to find out about all of Karen’s books. Click here to download a PDF file containing a list of all available classes. Email me to schedule a class for yourself, your business or your organization, or for further information on pricing and options. Watch a video of my class, teaching community members about important health literacy skills. Click here to listen to a radio interview I did with Susan Arbetter. I was on The Capitol Pressroom radio show with Timothy Williams, explaining how Health Literacy for All is helping educate people about Medicare and the NYS Health Exchange health insurance options. You can read articles by me and other women writers on Elaine Houston’s website, SheSpeaks2Me.com. Below are two recent interviews I did on WNYT, about making your facility handicapped accessible and about the holiday blues. Below is an interview I did on what Health Literacy is, on NYS Assembly TV. Many thanks to Assemblyman Angelo Santa Barbara for doing the interview.